Now a major motion picture starring Colin Firth and Rachel Weisz, directed by James Marsh (The Theory of Everything). In 1968 Donald Crowhurst was trying to market a nautical navigation device he had developed and saw the Sunday Times Golden Globe 'round the world sailing race as the perfect opportunity to showcase his product. Few people knew that he wasn't an experienced deep-water sailor. His progress was so slow that he decided to shortcut the journey, falsifying his location through radio messages from his supposed course. Everyone following the race thought that he was winning, and a hero's welcome awaited him at home in Britain. But on 10 July 1968, eight months after he set off, his wife was told that his boat had been discovered drifting in the mid-Atlantic. Crowhurst was missing, assumed drowned, and there was much speculation that this was one of the great mysteries of the sea. An Abridged version would be better. An interesting story, however having to live through his total failure isn't the best learning experience. The reader did a good job. Donald Crowhurst proves that highly intelligent (and brave) men can make many bad decisions, leading to ultimate failure. This brings into question: what really is intelligence? The Strange Last Voyage of Donald Crowhurst is a fascinating account of his last voyage. Taking part in the global race was not enough for him. Deceit and ramblings about disembodied intelligence are consequences of his vanity. Nevertheless, all fascinating stuff. A very interesting but deeply flawed man. The best decision would have been to wait the following year to embark on the race but to Donald Crowhurst, hesitation was minus time and action plus time. Neither he nor the boat was ready. There are many lessons in this book. My rating: 5/5. Highly recommended. This book is a fascinating look into the 'mind' of an intelligent and articulate man, who was brought to the very edge of sanity. The narrative is carefully constructed so that you can understand how Crowhurst got from A-B. B being the final scenario we are left with. Well written (although slightly meandering at times) and well read by the narrator. A perfect voice and pace for this subject matter. Crowhurst very much appears to be a jack-the-lad with a conscience. A victim of his own internal moral code. Huge con, hubris or a flawed ego? If you could sum up The Strange Last Voyage of Donald Crowhurst in three words, what would they be? Crowhurst's final night at home was memorable, but not enjoyable. His final night at home and some observations by his wife. I followed this round the world yacht race as covered by the Sunday Times at the time and was bewildered and then angered by the cheating and duplicity. But this book goes below the public personna of Crowhurst. It reveals a flawed man; one whose ego and judgement ruled over practicality and common sense. His arrogance was rarely tempered, but his vulnerability and fears are laid bare in this account. Fascinating and compelling listening and I'm looking forward to the film. Since the disappearance of Donald Crowhurst at the end of the 1968-69 Sunday Times Golden Globe round the World Yacht Race, there have been all kinds of recreations in fact and fiction. 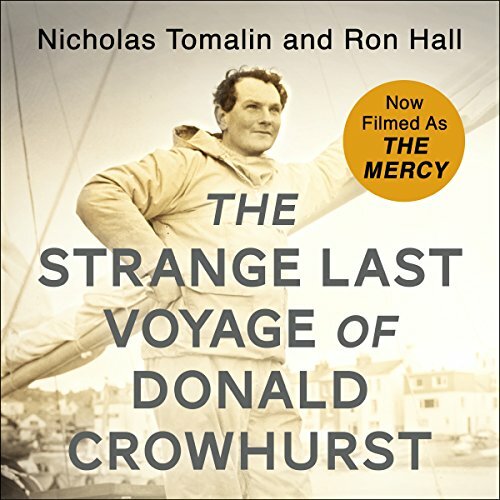 This comprehensive and definitive account of Donald Crowhurst's voyage and of the man and his mind was published in 1970 by Nicholas Tomalin and Ron Hall and has been released as a download in advance of The Mercy, the new film with Colin Firth as Crowhurst. As a sympathetic, insightful and scrupulously researched account, it is excellent. Crowhurst, the adventurer, larger-than-life, clever, mercurial, set off on the race completely unprepared and by today's standards, inexperienced in his barely finished catamaran to sail single-handed across some of the most dangerous oceans of the world. The letter he left behind for his wife Clare to read if he did not return is loving and moving and shows a serious and apparently well-balanced mind. By the time he slipped into the waters of the Atlantic 243 days later he was well advanced into 'time madness,' into which lone sailors can descend, which led Crowhurst to be believe he was some kind of god or cosmic being who had unwrapped the secrets of metaphysics. The authors have scrutinised every word of Crowhurst's voluminous log books, both his 'real' ones and his 'fake' log books with which he intended to fool the race officials that he had indeed circumnavigated the world and not merely circled aimlessly around the Atlantic. As an intimate insight into Crowhurst's mind it is brilliant, and listening to his agonies in 'life's tortuous game', you cannot but feel a terrible pity for him caught in the hideous position he had made for himself. As his arrival in Teignmouth approached closer and closer and radio messages reported the hordes waiting to welcome him it becomes almost unbearable. His obsession with Einstein fed his delusions and madness which in the end clouded even his deep love for his wife and children who were waiting to welcome him home. It's a very fair, undramatic book (there's drama enough in Crowhurst's life) and the final assessment that he fell short of his own vision is a fitting epitaph. The narration is first rate and captures the whole spectrum of Crowhurst's feelings as his mind disintegrated. Fascinating, but long passages from Crowhurst’s log book can make it drag in parts as an audiobook, you’d skip through these bits if you were reading it. But it’s good overall. goodness me what a ride!!! i loved this book from beginning to end. the narrator does a fantastic job in bringing donald crowhurst to life, and telling his amazing story. If you enjoy tales of the sea this might be for you, but the bottom line is that there are a lot of detailed descriptions of things to do with sailing. The story of Crowhurst himself is fascinating, but the books needs drastic cutting so that the main story emerges from the muddle of detail. Probably a good listen for sailors. I first came across Donald Crowhurst in Peter Nichols' wonderful "A Voyage For Madmen" which got me hooked on the story of one of the daftest races ever attempted. Not through any fault of Nichols, I came away with a picture of Crowhurst as the type of seedy and tragic con man so often encountered in the pages of a Graham Greene novel. Before I was too far into this book however, suspicions of another kind were emerging. Have you ever had a friend with bipolar disorder? Crowhurst's whole life - his ability to erect promising prospects for himself only to pull them down around his ears at the last moment; his tendency to create extreme and unnecessary chaos; dramatic weight loss, his inability to plan, and (without wishing to give anything away) some of the awful things that were happening towards the end of the book, sadly reminded me of my friend whose own illness ended in premature death. The authors, puzzlingly, don't make this connection but they, like me, aren't doctors. Who can possibly know definitively what was going on with this gifted, but tormented man? The book is a convincing and engrossing exercise in deduction, drawn from the fragmented, confused and deliberately misleading records of an increasingly tormented mind, the torment coming both from a free-fall into extreme mental illness and the conflict created by the realisation that the fat was in the fire as far as being able to cover up an increasingly huge bank of lies. I was reminded of those lines by Gerard Manley Hopkins: "O the mind, mind has mountains; cliffs of fall/ Frightful, sheer, no-man-fathomed. Hold them cheap/ May who ne'er hung there." Chay Blythe, back in England, adopts the unlikely role of brooding Nemesis, and invisible furies pursue this poor Odysseus so viciously that there was to be no return to Ithaca and patient Penelope. The voices missing (for obvious reasons) from the story, are those of Donald and Clare Crowhurst's children. The mind balks at any attempt to imagine the immense suffering they have endured. What three words best describe Philip Bird’s voice? If you could play editor, what scene or scenes would you have cut from The Strange Last Voyage of Donald Crowhurst? Quite a lot that didn't really seem to add anything to the overall story. I really found this book very tedious. Additionally I didn't find Donald Crowhurst particularly interesting or engaging as a character. Not very amazing !